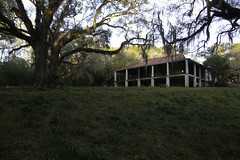 Home › Historic Preservation › Who Built the Lyceum? I admit I’m spending far too much time this week glued to my television and/or computer watching the latest updates on Hurricane Irma. Something I do when I’m watching too much TV is to sort through stacks of papers that I’ve built up over the last however many months and try to be productive, and while doing that this time, I came across a copy I had printed of a short, fascinating book published by J.W. 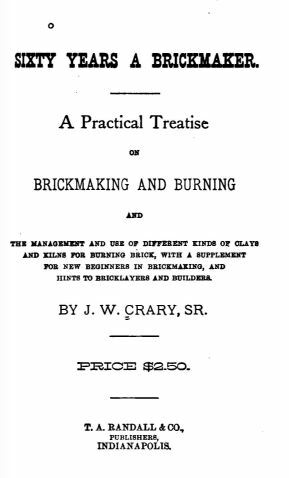 Crary, Sr. in 1890 titled, Sixty Years a Brickmaker: A Practical Treatise on Brickmaking and Burning. . . .
Well, why don’t you read the whole title for yourselves? Mr. Crary [a native of Ohio] worked with his father until the late autumn of 1834, when he went South, and was, up to the close of our war of the States, a constant jobber, contractor, manufacturer, and superintendent as brickmaker, and part of the time as brick layer, just the same as his father had been from Mr. Crary’s earliest boyhood. 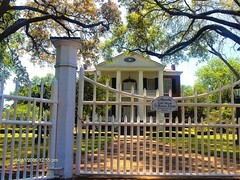 As Mr. Crary’s writings show, some of his prominent work was making the brick by contract for the U.S. Arsenal at Little Rock, Arkansas, in 1840 and 1841; making and laying the brick for the State University of Mississippi, in 1845, and 1846; superintending the making of all the No. 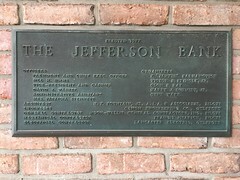 1 brick for the U.S. Custom House, in New Orleans, in 1852, ’53, and ’54 . . . 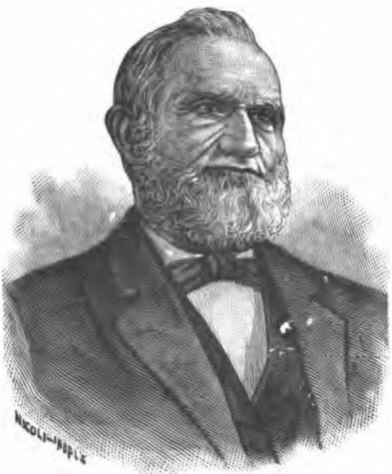 This line drawing of Crary is pretty great–doesn’t he look like a crusty old brick mason who wrote a book called “Sixty Years a Brickmaker”? 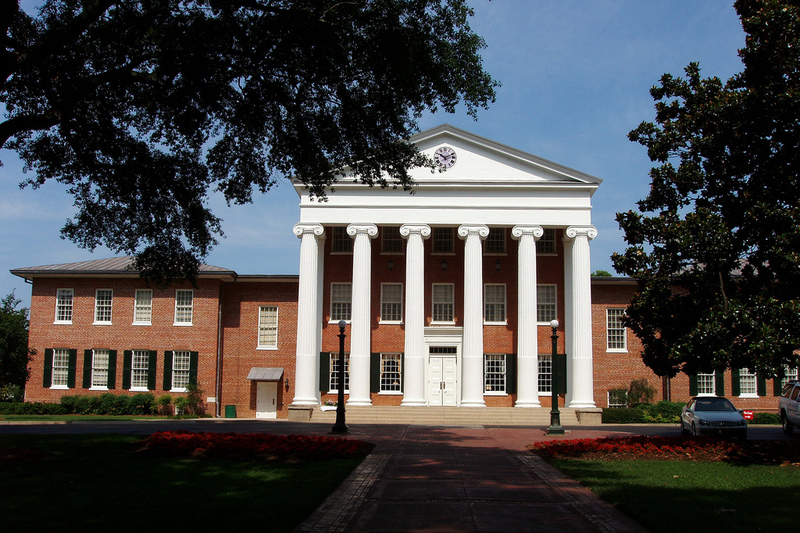 Anyway, in case you missed it in the quote above, Crary is credited with “making and laying the brick for the State University of Mississippi, in 1845, and 1846.” The “State University” of course, is not “Mississippi State University,” but that other one, the “University of Mississippi” in Oxford. 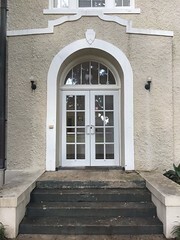 William Nichols was the architect who laid out the initial plan with the Circle as its organizing core, and he designed a number of buildings for the new campus, mostly completed by 1848. 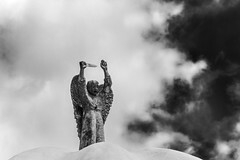 Presumably, Crary was engaged in one of the earliest tasks on any construction project, a task that had to start up to a year or more before building could start–the process of taking clay out of the ground and turning it into brick. The quote above also credits him as the brick layer for Ole Miss. Since construction took several years, not just 1845 and 1846, it’s not clear whether he did all the brick laying, but he probably did all of the brick making for the original buildings. The most famous original building is the Lyceum, but the Croft Institute is also an early building that Crary may have had a role in building, although it may date to the early 1850s. At one place I had charge of a dry press machine that made twenty thousand brick per day, also of tempered clay, molding by hand twenty thousand. I set and burned both kinds of brick in the same kiln, about half of each. I found that the dry pressed brick “dried off” slower than the mud brick, and the fire was slower in getting out at the top, but after “fires were up” the dry pressed brick burned out faster than the mud brick, and were ready to be “closed up” sooner, though, “fired” the same way, but slower the first thirty-six hours. Those brick were made for the large United States Custom House in New Orleans, in 1850 and ’51. The officer in charge came to our yard to inspect the first kiln, which was very thoroughly burned, and though prejudiced against dry pressed brick, after a fair and full test, pronounced the dry prssed brick superior to the mud brick. This brick yard was on Biloxi Bay, in the State of Mississippi. According to the General Services Administration, “the majority of the [U.S. 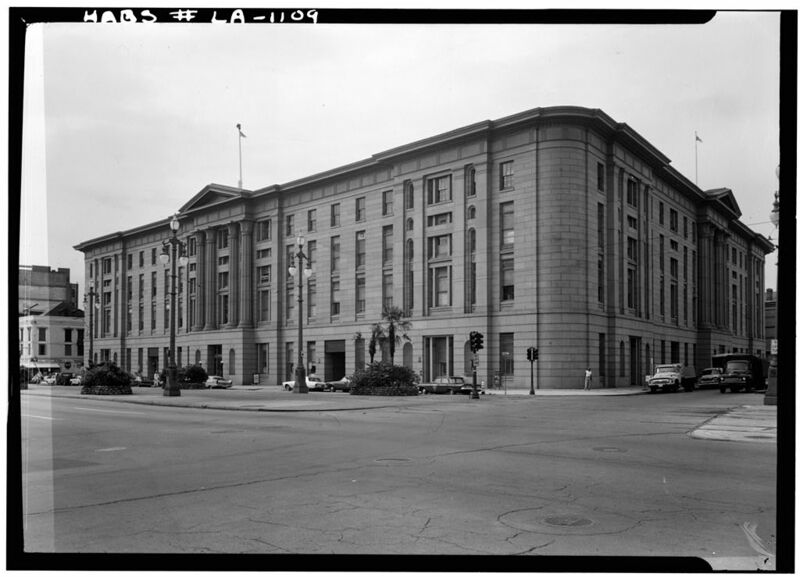 Custom House] is constructed of brick sheathed in gray granite from Quincy, Massachusetts.” So unlike the Lyceum, where you can view Mr. Crary’s handiwork at close range, at the Custom House, you’ll have to search to find some exposed brick to pay homage. Nevertheless, it’s good to know that there’s a big piece of Biloxi Bay sitting right on Canal Street in New Orleans. All thanks to a crusty old brickmaker, Mr. J.W. Crary, Sr. Wondering what would be the reason for selecting to paint and pencil a brick building when quality bricks were at hand. I supposed that the large amount of fuel to dry the clay and the associated fuel costs that would be passed on to the customer was likely the deciding factor as to why a building was painted and penciled even when quality pressed brick is available. Seems cost has always driven just about ever building decision. I remembered that it had been commented on in a previous post, but when I searched for Crary and Brickmaker, I couldn’t find it and gave up. Glad one of us has a memory nowadays. We certainly didn’t talk about Crary’s Lyceum connection! I don’t think most folks read these comments anyway. Glad to have a real deal post about this interesting book. I would guess that Crary probably did little actual bricklaying if he was the man in charge of all the masonry on site. He would have had to manage his crew and make sure every last supply they needed was on site, on time. A tough job in 1840s Oxford when you had to make the brick and lime mortar from scratch. He (or someone else) would have had to start firing bricks and slaking lime the building season before construction started. I am reminded about how a church I visited, St. Michael’s Catholic Church in St. Florian, Alabama was constructed. It was entirely constructed by the German parishioners who lived in the area. The year before construction began, they dug a large pit and filled it with lime and water, mixing the two together. They then filled the dirt back over the pit. The next building season, they removed the dirt to find perfectly slaked lime ready for mortar and, later, plaster. 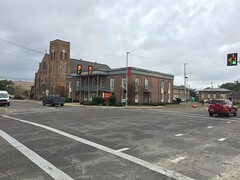 Although this church was constructed in the 20th Century, those rural parishioners used traditional techniques that would be far more similar to those used in the 1840s than those used in early 20th Century urban areas.